I love anything related to organization, so when I was invited to try out some new products from Snapware's Fall Solutions Line I was really excited! Snapware has an extensive line of home organization products including kitchen canisters, cupcake carriers, ornament boxes and more! 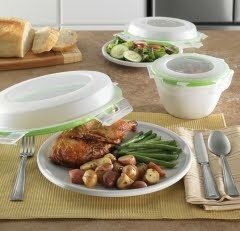 This product lets you prep, cook, serve, and store - all with one container! It's great for plating a meal and heating up afterwards. You just snap on the air-tight lid and go! You can even leave the lid on when you put it in the microwave! I received this product in two sizes, and both are great! 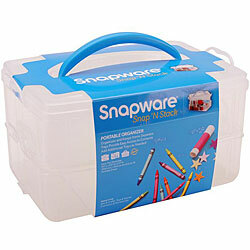 This product is great for storing anything from paperwork, to art supplies and cupcakes! It's really versatile and is a great storage solution for coupon inserts! It's so nice to be able to stack everything and keep them neat and contained! This piece is great for anything from sandwiches to crayons to jewelry! It's a two piece container that snaps together for easy portability. **Open to U.S. Residents only. I was provided with a product in order to write this review. All opinions are my own. This giveaway is not sponsored by Snapware. I need to get organized so this sounds perfect, would love to win! I follow you on GFC, thanks! I follow you via feed burner! This would be wonderful for me!! I would love to win and b included in this. I want to win this , sounds so cool. I Like Frugal and Fabulous on Facebook! I would love to win because my mom & sister are always raving about snapware and I have been wanting to try them (and I really need to a way to better organize this kind of stuff). 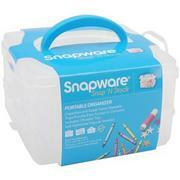 I LOVE Snapware! If I could afford it I'd have a house full! I follow you publicly on GFC! "crave to save"
I like you on FB "Crave to Save"! I want to win! I need these! lol Thank you for the opportunity! following on twitter as @ajoyfulsong and tweeted! I totally want to win! I would really really love to win this! I have been needing something just like this.